This article is about the former Oklahoma governor. 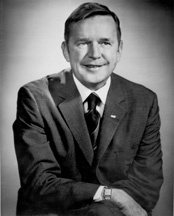 For his son, see Dewey F. Bartlett Jr.
Dewey Follett Bartlett Sr. (March 28, 1919 – March 1, 1979) was an American politician who served as the 19th Governor of Oklahoma from 1967 to 1971, following his same-party Republican predecessor, Henry Bellmon. In 1966, he became the first Roman Catholic elected governor of Oklahoma, defeating the Democratic nominee, Preston Moore of Oklahoma City. He was defeated for reelection in 1970 by Tulsa attorney David Hall in the closest election in state history. He was elected to the United States Senate in 1972 and served one term. In 1978, he was diagnosed with lung cancer and did not run for reelection that year. He died of the disease in 1979. Dewey Follett Bartlett was born to David A. and Jessie Bartlett in Marietta, Ohio, and attended schools in Marietta and Lawrenceville, New Jersey. He was president of the senior class at Princeton University, where he earned an undergraduate degree in geological engineering in 1942. Following his university graduation, he enlisted in the Navy; then served in the U.S. Marine Corps as a dive bomber during World War II in the Pacific theatre. After the war, he moved to Tulsa, Oklahoma, where he held various jobs in farming, ranching, and the oil industry, inheriting ownership of the Tulsa-based Keener Oil and Gas Company from his father, David A. Bartlett. Prior to becoming governor, he served in the Oklahoma Senate from 1962 to 1966. As governor, Bartlett made major changes to the Oklahoma Department of Corrections, pushed for school consolidation, and vetoed a school code bill. In 1970, he was the first Oklahoma governor eligible to seek a second term. In the general election, he was challenged by then-Tulsa County Attorney David Hall. In the closest gubernatorial election in state history, Hall unseated Bartlett by a vote of 338,338 to 336,157. Following his defeat, he served for one term in the U.S. Senate from 1973 to 1979 after winning the seat previously held by Democrat Fred R. Harris. He narrowly defeated U.S. Congressman Ed Edmondson in the 1972 election riding on President Richard Nixon's coattails. During his tenure in Congress, he took a conservative stance on most issues and championed oil and gas interests during the energy crisis of the 1970s. However, he suffered health problems and, rather than face a very difficult reelection against popular Democratic Governor David Boren, decided not to seek reelection. Two months after retiring from the U.S. Senate, he died in Tulsa from complications of lung cancer, and is buried in the city's Calvary Cemetery. In 1990 he was inducted into the Oklahoma CareerTech Hall of Fame and in March, 2006, Congress passed a bill renaming the U.S. Post Office in Tulsa in his honor. Bartlett married Ann Smith, a native of Seattle, Washington on April 2, 1945 at Mission San Juan Capistrano in San Juan Capistrano, California. They had three children: Dewey F. Bartlett, Jr., Michael and Joanie. His son, Dewey F. Bartlett, Jr. served as the mayor of Tulsa, Oklahoma, from 2009 until losing reelection to G. T. Bynum in 2016, as a former member of the Tulsa City Council from 1990 to 1994, and has inherited the Keener Oil and Gas Company from his father. ^ a b c Burke, Bob. Encyclopedia of Oklahoma History and Culture. "Bartlett, Dewey Follett (1919 - 1979)." Retrieved November 23, 2012. ^ a b "BARTLETT, DEWEY FOLLETT (1919–1979)". Oklahoma Historical Society. Retrieved 2018-01-27. ^ Who is Who in the Oklahoma Legislature: 29th-36th, 1963-1978 Legislative Reference and Research Division, 1963. ^ Gov. Dewey Bartlett, Oklahoma CareerTech Hall of Fame (accessed 2014-04-22). Bonner, Jeremy (2007). The road to renewal: Victor Joseph Reed & Oklahoma Catholicism, 1905-1971. CUA Press. ISBN 0-8132-1507-2. Smith, James (1993). Strategic calling: the Center for Strategic and International Studies, 1962-1992. CSIS. ISBN 0-89206-237-1. United States Congress. "Dewey F. Bartlett (id: B000200)". Biographical Directory of the United States Congress. Retrieved May 5, 2013. "Dewey F. Bartlett". Find a Grave. Retrieved May 5, 2013. Voices of Oklahoma interview with Ann Bartlett. First person interview conducted on June 5, 2010, with Ann Bartlett, wife of Dewey F. Bartlett.